A number of people I know or have bumped into when out walking were lucky enough to get a puppy in the last few weeks and I’ve had a number of conversations about all things baby dog. We’ve spoken about everything from chewing, confinement, barking, sleeping, eating, playing, toileting and training techniques. It’s great to see that everyone I’ve chatted with are getting the ‘positive’ message and rewarding their dogs for doing the right thing whether it’s settling in their crate or peeing on the lawn at night. It’s clear they want to set the right foundation for their dogs. Keep everything positive. They are absorbing the world and how it works like a sponge. Don’t make anything punishing. Either reward what you want; or interrupt the behaviour that’s unwanted, ask for something else and reward that; or ignore it. 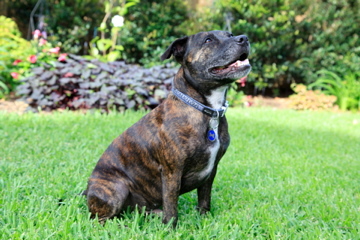 Dogs are social creatures and have been bred for companionship. Make sure they’re allowed in the house but on your terms. Close doors to rooms while you’re toilet training and if you don’t want them on the furniture provide a comfy alternative that’s their spot. The three basics of enough exercise, stimulation and training will help prevent the behaviours that aren’t desired. Tired dogs don’t bark, those that have enough chew toys are more likely not to eat the couch. And it’s never too late to teach a dog a new trick. Get toilet training down pat by taking them out every hour, after a sleep, play or feed and anytime they are looking unsettled. Reward heavily for toileting where you want them to and make sure you get them to go on wet grass too. Make all new experiences happy – from the sound of the vacuum cleaner to different ways human being dress (hats, sunnies, uniforms) and the objects we carry such as umbrellas or back packs. Sound Proof Puppy Training has a great app available to help dogs get slowly and gently used to the many noises they’ll encounter and not to be scared such as storms, buses, grooming tools, fireworks etc. Read as much as you can from good quality dog training sources. 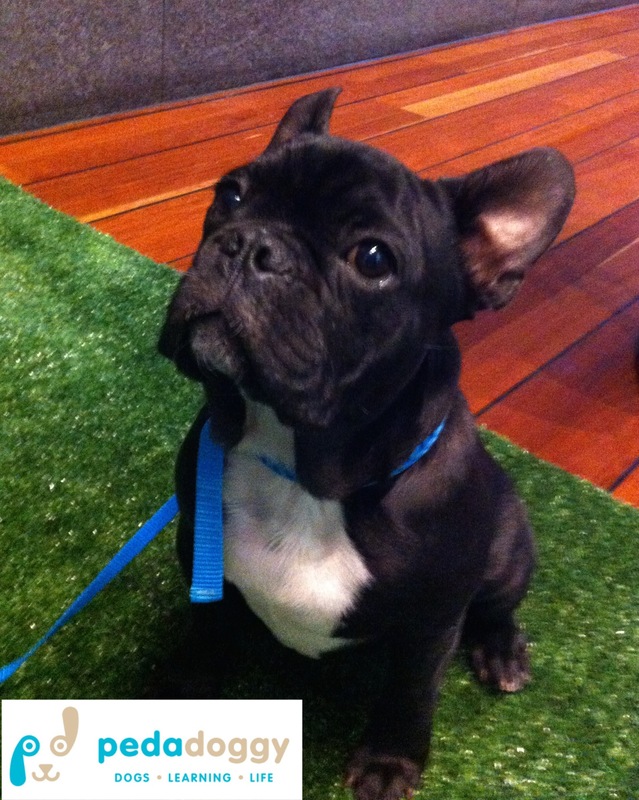 Positively has some really good articles and tools on how to raise a happy, confident and well socialised puppy. Work on building a relationship of trust and you’ll be rewarded by years of unconditional love, lots of laughter and a fabulous member of the family. Have fun with your new furry friend and remember that the strong and positive foundation you set now will be the behaviour you are likely to see from your grown dog in the next few months as they grow up so fast. I think I may have written the world’s first-ever positive reinforcement dog training poem. Published by Pedadoggy for the first time. Enjoy! To have a dog rest at your feet. And so past the hours fly. For how do these two make a team? The other takes great joy in smelling poohs. Let us review the family tree. Before human beings grains did grow. When camp fires through thick forests shone. Were priorities of the human brood. Fiercely proud and extremely hairy. Who overcame fear with their bold desire? Fed and laughed and took their naps. Stole some pieces when they weren’t looking. Without following it swiftly with a stone? As its priority was to defend and protect. Traded fear in return for some feed. No teeth bared in exchange for a snack. Isn’t this a place you’d want to call home? have passed since that first meeting of minds. Eat and sleep, run and play. And between the two a new bond has been born. Staffy, whippet or even cavoodle. Except for the time when they bring in a mouse. And so these two creatures live lives intertwined. Be kind to them when manners you teach. And to punish them at all is so very wrong. That food helped the wolf learn new things and grow. As their happiness will be yours too for sure. Imagine one morning you get to work. You boss starts shouting at you about being late as soon as you walk in the door, although it’s the same time you arrived the whole month before and it’s well before office opening hours. Make the rules wisely and apply them with kindness and consistency. Confusing? Certainly. Frustrating. Absolutely. Inconsistent. Yes-sirree. But at least both of you speak the same language. Now imagine the premise of this scenario which many dogs face. One moment they’re being fed roast chicken skin from the table when they make whiney noises under a chair. But the day stern Auntie Marg comes to visit, the dog is admonished by the owner for the same begging behavior. Or a dog that is invited onto the bed on the day the laundry is due to be done, but told off for jumping up there at other times. Confusing? Certainly. Frustrating. Absolutely. Inconsistent. Yes-sirree. With an additional consequence added for the dog – fear of doing the wrong thing, which creates a lack of confidence and certainty. If you’re not sure of doing the right thing you’re certainly not going to be sure of doing a lot of things, to avoid punishment – whether it be verbal or physical. The thing is, dogs don’t know when it’s washing day compared to when the sheets are clean. They also don’t know about social etiquette as not jumping on the couch they usually lie on when a visitor comes around. That’s their spot. From their perspective they’re allowing the visit access to and sharing their couch space. We expect our dogs to intuit, deduct, instinctively understand or at best guess what the rules are. Isn’t it far kinder to them to make one rule and stick to it? If the outcome you want is a dog that is well behaved, which in my experience is what most people want from their companion animals, then you’re better off thinking about the rules you make and being consistent in their application (I have chosen not to use the word ‘enforcement’ here. I personally don’t like cleaning very much and therefore don’t allow my dog to sit on the furniture. However, he has his own dog bed and comfortable mattress in the lounge which he is free to sit, lie or play on. When guests come, they can sit on the couch in peace without being covered in dog hair or have their face licked as they sip their cup of tea – and the dog knows exactly where he has to be, though sometimes the excitement is just too much for him and I have to lure him back to the mat which is also okay. Nobody’s perfect! I’m not saying dogs shouldn’t go onto furniture as it’s a personal choice – but it doesn’t work for me and I therefore make it a consistent rule for Zac. For a happy dog that understands the rules, make them wisely and apply them kindly and consistently. For as American politician Lincoln Chafee said: “Trust is built with consistency”. This lesson applies as much to dog training as it does to running election campaigns. With dog training involving a lot less barking and jaw snapping of course. Make this long weekend a fun weekend! The prospect of a public holiday on Monday means an extra sleep in and more time to spend with my dog. Woohoo! Try as he might, the Jakaranda tree always wins! Make sure to buy a specially-designed pet tyre as they don’t contain steel as tyres for vehicles do. 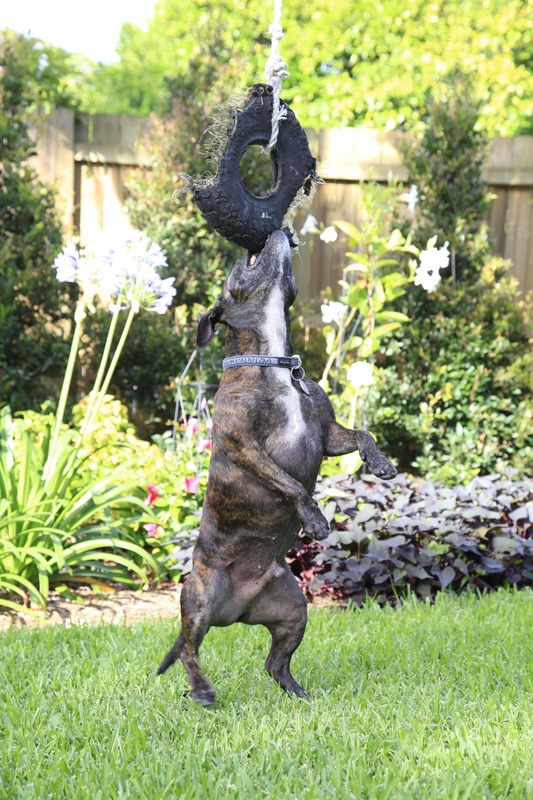 Tie his pet tyre to a tree and watch the tree win tug-of-war every time. Go for a walk – anywhere will do, as long as you take time to sniff the roses and the lamp posts (erm, just to be clear, I go for the roses). Train a new trick to show off and yes old dogs will happily learn new things if you make the food rewards worthwhile. Roast chicken, anyone? Play ‘hide the treat’. He sits and stays in one room. I hide a treat in another and only when he is called can he come and search for it. Take him with me to as many places as possible, as just getting out and about is great enrichment which keeps him from barking and digging. I signed him up for companionship, not isolation. How do you and your pet have fun together? Zac – Pedadoggy’s doggy and training inspiration. Dogs, life and learning. They’re all intrinsically intertwined if you enjoy the companionship of dogs and having them as another member of your family. The definition of ‘pedagogy’ is the art or profession of teaching. Pedadoggy reflects on the process of learning for both humans and their dogs. Whether it’s the revelation of a new skill, insight into what drives us or simply doing what we enjoy doing best, even just a small amount of time with a dog and you’ll know exactly what I mean. Modern dog training is based on well-established learning principles that have been chartered by scientists and psychologists over many years. While some dog trainers still advocate punishment in various forms to change behavior, it simply is more fun and builds a better relationship if you focus on reward through a positive approach. And in the process you may learn something about yourself too. So welcome to Pedadoggy – where the dog is both the student and the teacher.